Whether justified or not, at the start of every college football season each fan base has hope. Hope that a committee of thirteen people who eat, sleep, and breathe college football all believe that your team is worthy. 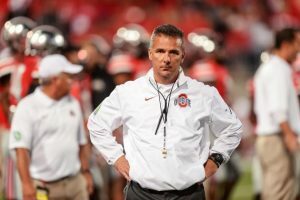 I will admit it, I have bias, and have been lucky enough to experience that hope come to fruition on multiple occasions since the start of the College Football Playoff. I am an Ohio State Buckeyes fan living in Columbus who will be attending the university next year. In 2014, when the Buckeyes made that late season run after Braxton Miller and J.T. Barrett went down, Ohio State’s destiny was in the hands of the committee. When Ohio State was announced as the fourth and final team to make the playoffs, it was the best feeling ever. Allow me to give you a guide as to what you should want to happen as I analyze each contender’s current resume as it stands as well as the best case scenario that COULD get your team a playoff berth. Oklahoma has probably been the most polarizing team in college football this season. This title makes sense considering that they have one of the most polarizing player in college football: Baker Mayfield. Mayfield has torn up college football this season. 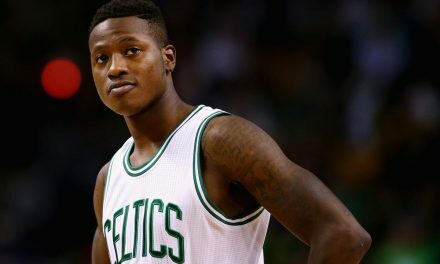 His personality may certainly be questioned, but his talent should not. The resume should be all about what the team has done, but when you have a figure like Mayfield, he stands alone as a reason to consider Oklahoma for the playoffs. Do not get it twisted. If they defeat TCU, Oklahoma deserves a spot. This game is far from in the bag however. Even with the quality win in Columbus versus the Buckeyes, the Oklahoma defense has had a knack for giving up points, which could certainly make this rematch interesting. Oklahoma had one bad loss, and it was to an unranked Iowa State team. Other than that, with a win this Saturday vs TCU, the resume sparkles. Plain and simple, win and they are in. Let’s be honest, love him or hate him; you want to see Baker Mayfield on the big stage again. While the game itself is far from ‘plain and simple’, if Oklahoma prevails, which is a big “if”, consider them a lock for the playoffs. 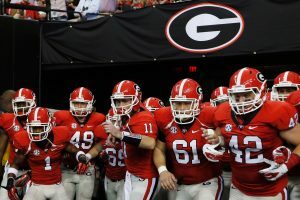 In review, Georgia’s season has been a long-awaited return to the top of the college football ranks. Former Alabama defensive coordinator, Kirby Smart, in his second season heading the program at Georgia has officially turned things around. Georgia has the fourth-ranked total defense in college football, and has only one blemish on its resume: a blowout loss to a school none other than the one they are about to face, Auburn. Georgia’s resume is highlighted by one quality win against #24 Notre Dame. The biggest test came against Auburn, when Georgia forgot to show up, getting blown out 40-17. Georgia has the chance of a lifetime. Make the committee forget about that loss by defeating Auburn this Saturday. First things first, if Georgia doesn’t defeat Auburn they will be eliminated from contention. However, if they do beat Auburn, they will have a great case and an amazing chance at the playoffs. They will have a quality win against #24 Notre Dame, and a quality win vs top-ranked Auburn. With that comes the SEC Championship. With a win over Auburn, and assuming Oklahoma defeats TCU, they should be safe. Auburn may very well be the hottest team in college football right now. 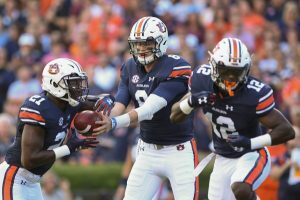 Led by Jarrett Stidham and Kerryon Johnson, Auburn has defeated both Georgia and Alabama while ranked #1 in recent weeks. One geek may say, “BUT THE COMMITTEE HASN’T EVER PUT A TWO-LOSS TEAM IN THE PLAYOFFS”, but do not listen to them. 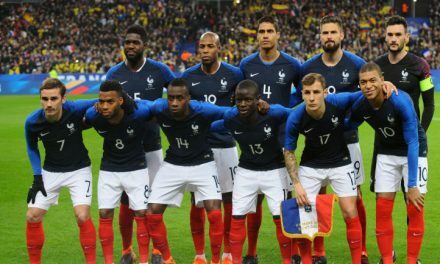 This season there are more teams with one and two losses than before. Auburn only has one bad loss, anyway, with the other probably the best loss a team can have: 14-6 vs Clemson in the second game of the season. The other loss coming to LSU certainly does not look great, but they defeated two #1 teams. ‘NUFF SAID. If Auburn defeats Georgia again, they are in the playoffs. However, Auburn fans, I would not lose all hope if Auburn plays well and loses to Georgia. They have destroyed them already, and defeated Alabama. Should Oklahoma lose, Ohio State win, and Auburn lose, I would not be surprised by the idea of Auburn sneaking in with the ACC winner, Georgia, and Ohio State/Alabama. Crazy to imagine a three-loss team making the playoffs, but it could happen! Like Georgia, this season has been a long-awaited return to the top for Miami. The recent addition of head coach, Mark Richt, along with good recruiting, has brought back the Miami we all remember from the early 2000’s and before. 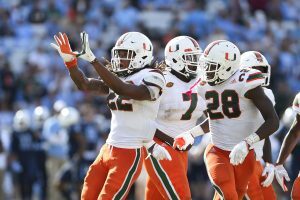 Standing at a record of (11-1), Miami’s quality wins have come against #13 Virginia Tech, and the breakout game vs #3 Notre Dame. The Turnover Chain swept across the country after the upset victory vs Notre Dame. Their time in the sun didn’t last too long, though. A few weeks later they were upset by Pitt 24-14. With a victory over Clemson, a team who many assume is the best team in the country, should all but guarantee a playoff spot for Miami. Defeating Clemson is probably the toughest task that any team has ahead of them this weekend. Dabo Swinney has a very good thing going on both sides of the ball for Clemson right now. The Turnover Chain will need to be in full effect against Kelly Bryant and that Tiger offense for Miami to pull through and clinch a playoff berth. Win and you are in. Clemson’s resume is filled with quality win after quality win. They defeated Auburn 14-6, at #14 Louisville, and at #12 Virginia Tech. 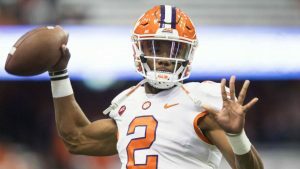 Clemson has certainly proven themselves even with their ugly upset loss to Syracuse. They have one of the best head coaches in football, being the defending National Champion could help, and they seem unstoppable. There are a few ways that Clemson could get into the playoffs. The first, and most direct way: Defeat Miami. If Clemson defeats Miami on Saturday night, then they will likely head into the playoffs as the #1 seed. 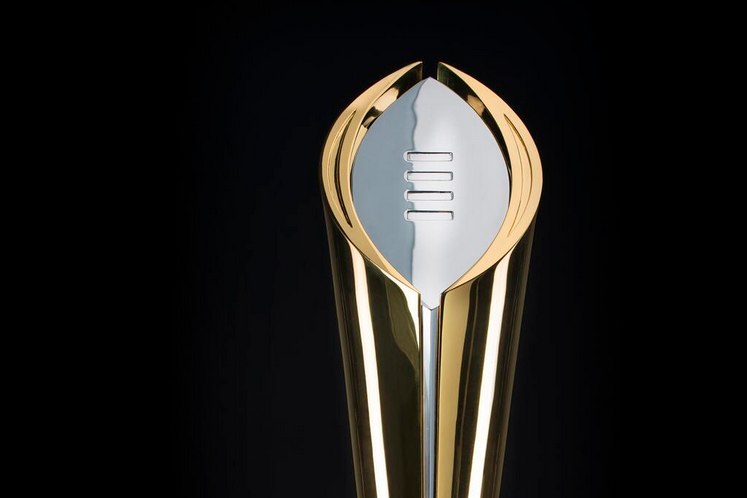 The second, if they lose to Miami, but Oklahoma loses to TCU, while Wisconsin defeats Ohio State, and Auburn defeats Georgia, the committee could put them in over Alabama as the fourth and final team. The third, Clemson loses to Miami, Oklahoma defeats TCU, Ohio State defeats Wisconsin, and Auburn defeats Georgia. The committee would have to choose between Clemson, Ohio State, and Alabama. 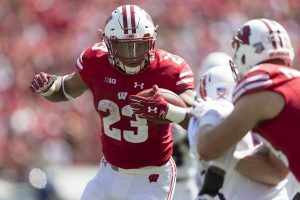 Wisconsin’s biggest win this season was against #24 Michigan, a game that many didn’t believe that Wisconsin would win. Wisconsin is the only unbeaten Power-Five team left, and have the #1-ranked total defense. They have a clearly stout defense, withthe offense led by a stud freshman RB, Jonathan Taylor. Wisconsin has so many doubters because they haven’t had any “true” quality wins this season. Michigan isn’t truly a quality win. This resume is questioned, rightfully so, but that could all change Saturday night. Wisconsin defeating Ohio State should, and probably will, get them in. as undefeated Big Ten champions. Unless the win is the ugliest win of all time, I do not see any way that the committee decides to put Alabama in over Wisconsin (assuming Oklahoma wins). With an ugly and unbearably boring win, it wouldn’t surprise me if the committee imagined an Alabama and Nick Saban vs Wisconsin game… who do you think would win? I would take Alabama right now, but this all depends on how Wisconsin plays/wins. Wisconsin just has to play well and win the game to avoid any discussion. If Wisconsin does decide to win the ugliest type of 14-10 game, the “Alabama or Wisconsin” question would fade away. If Oklahoma loses and Clemson wins, they would both be in anyways. Four weeks ago, Ohio State was all but eliminated from the playoffs. After a quality 48-3 win vs #12 Michigan State, then running the table, Ohio State’s hopes are alive. They have the quality win vs Michigan State, and they also have the win over #2 Penn State. They have two losses, one not completely awful, vs Oklahoma. The other is probably the worst loss a team can have, at Iowa 55-24. Ohio State has no guaranteed path to the playoffs. With that said, they will be eliminated if they do not defeat Wisconsin on Saturday. The best thing that Ohio State can do for themselves is to absolutely route Wisconsin. Leave the best impression that they can. The easiest way for them to make the playoffs is to put on an amazing performance in a win vs Wisconsin, and for Oklahoma to lose. That would give the committee another reason for Ohio State to get in. The likely scenario has Oklahoma winning, though. Knowing that, it will come down to Ohio State as Big Ten Champions vs Alabama. Urban Meyer vs Nick Saban. Alabama by far has the slimmest odds of making the playoffs out of the listed teams. They do not have a true quality win, like Wisconsin, but they aren’t undefeated like Wisconsin. Alabama lost its only quality- level game against Auburn this week, two weeks after being on upset alert by Mississippi State. The game resume isn’t great, but again… this is ALABAMA we are talking about. 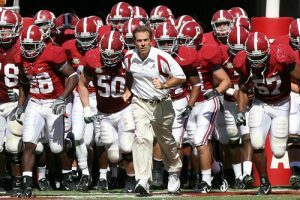 They have Nick Saban, they have multiple first round picks, and they have been to the title game back-to-back years. The benefit of the doubt may apply to them. Like I mentioned above, Alabama will be biting fingernails all weekend long. Alabama should out-cheer the biggest TCU fans this weekend. If Oklahoma loses to TCU, it practically opens up a spot for Alabama. The only scenario with Oklahoma losing that doesn’t look good for Alabama is if Miami defeats Clemson, and Wisconsin defeats Ohio State. That would put in the SEC winner, Miami, Wisconsin, and either Clemson or Alabama in. That is a tough match-up. Even if Oklahoma wins, Alabama can still make it, they just then become Ohio State fans. That would set up Ohio State vs Alabama for the fourth spot. Every college football fan in the world should look forward to Saturday. It could be one of the best days in college football history.